Sorry I’ve been so ‘lax’ in writing lately; still trying to get over the ‘creeping crud’ sickness – for want of a better name. Been dragging through the days with my head feeling like a 50 lb. block of cement – not fun. It’s kind of going away and I’m slowly returning to the ‘old’ me, but the operative word is “SLOWLY”. Even though I’ve been feeling really rotten, that doesn’t stop the constant march of things to do around here. I’ll admit – I skipped church last Sunday simply because I couldn’t envision me trying to SING in choir, or (at that point) even THINK straight! Monday began the “Mom’s Taxi” of driving – my usual schedule. Tuesday was Knit Night (we had 15 people – 2 new ones! ); the bad part? My head was so stuffed up I couldn’t keep my thoughts together! It got comical (to everyone else – not me) because people would ask me questions/directions/advice, etc. and my answers were all jumbled – it ended up people would help ‘translate’ for me! Weds. was supposed to be our Special Needs group but our weather was so bad with 65 MPH winds, we ended up canceling (YAY!) Thurs. was a luncheon with some ladies I used to work with 27 years ago – that was ‘interesting’; there were about 12 people, I knew about 5. People recognized me, but I didn’t remember them (MAJOR Senior moments occurred that day – helped along, of course, by the fact that I still had a big, stuffy head so thoughts were fragmented at best). After leaving the lunch a little early (I was the first to leave) had to rush home to babysit my grandson. That worked out OK, he mostly played by himself or watched TV. Friday was my special needs group’s Harvest Party – lots of activity, standing (more like running) for 3 hours – I made it through, was really tired afterward, but it worked out OK. (ended up sleeping ‘in’ 1 1/2 hours later than normal this morning, but I earned it!). Am feeling a little better today – no BIG plans, for a change! Oh, in between all the above activities, youngest son had 2 Color Guard practices, and 2 competitions (translation: me driving all over). He’s at their last competition right now in Clarkston; if they rank high enough, their group will be able to compete at the BIG one at Ford Field Nov. 7th; we’ll see… he’s already signed up for Winter Guard; same idea (flags/guns/sabers) but this will all be indoors – Yay! I wouldn’t want to be him/them – they’re practicing this morning in 43 degree weather – not my idea of fun! Because of the height of their flags and the heights of their saber tosses (20 ft in the air), they have to be outside (lots of thin layering of the clothing – can’t even wear jackets or heavy clothing because it gets caught in the ‘equipment’). So – that’s the plight of my days this past week – not very exciting or fun but I made it through to today – YAY! Right now it’s just my husband and I at home (almost seems strange, we’re so rarely alone!). Middle son is attending “Comicon” in Detroit (that’s a yearly Japanese Anime convention) through Sunday, youngest is at the competition until 10 p.m. so, for a change, I have an almost FREE day! Have an afghan to ‘edge’ (I finished it about a week ago, just haven’t had the time or energy to do that!) and that’s about all I can think of on the agenda! Oh, managed to get the special needs group newsletter finished and mailed; that, in itself, is a feat – add to that not feeling well and you’ve got a real challenge! Since I’m the editor (and all other newspaper-like job titles) it’s a 1 1/2 day job; printing 50 double-sided 4 page editions. Glad that job is done for another 2 months. Hopefully I’ll soon feel more like posting some good recipes, but for now, am just going to take it easy today. PS: Don’t know about your house, but here the phone has been ringing off the hook every day with the political calls! Drives me nuts! So glad TUESDAY will end all that! Remember to vote!!! This will be a short post ’cause I’ve been workin’ on sick: lots of sneezing, stuffed up nose, headache, etc. Think it’s a sinus infection and hoping it will go away soon. I should preface that with: got sick Monday and am slowly feeling ‘better’ each day, so it’s not as dire as it soundes (today just stuffed up – headache/sneezing/sick-feeling are gone). To add to the fun of the ‘sick’ I should add gaining a ganglion cyst on the top of my right hand to the list of ‘fun’ things not to get. If you’re not familiar with the above, it’s a sac of liquid which forms on top of a nerve, usually caused by too much of a particular movement, like a carpenter constantly using a screw driver (or, in my case – too much KNITTING!). Sigh . . . knew that would eventually happen, just didn’t plan on it coming now. You see, Sun-Mon. I was working on knitting these small 5 inch by 5 inch squares on size 4 needles (very small knitting, very tight, also – which means lots of excess wrist movement). To wrap this up: I got a package last week from Australia with 24 cute little afghan squares – too small to use on the regular afghans. That gave me the idea that perhaps I could knit more and make a decent sized baby afghan which could go with the Ghana afghans, hence my ‘tiny’ knitting. Think I’ve learned my lesson – knit only a little bit at a time on those and NOT on a regular, daily basis. Since I don’t exactly have a deadline for this afghan, I ‘could’ take my time making it. The tiny squares were nicely done and I didn’t want to just discard them after the sender had gone to all that effort to knit and send them. Sometimes a Pammie has to ‘learn her limits’, I guess. (double sigh). Let’s just put it this way, being sick and NOT being able to vent my frustrations on knitting is driving me nuts! Got out a book and started reading; I’m not a very ‘patient’ patient! There have been, and still are yet a few events I have to drive youngest son to this week (one of which is Homecoming – photos later); very glad my efforts are being conserved, as gripping the steering wheel is painful at this time. Good thing? The pain in the wrist is less today than yesterday – guess that means resting the wrist is a good thing (along with an ace bandage with Icy Heat). Hard to keep a good knitter down, but necessary at this time, I guess. 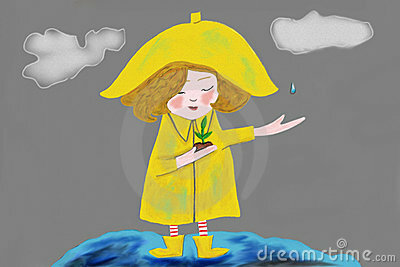 It’s getting windy, rainy and chilly these past few days (40 degrees today-Brrrrrrrr!) Hope you’re warm, cozy and enjoying your day! Went to pick up my mail at the post office today for “The Ghana Project” and there were two packages – one from Canada and one from Australia! “The Ghana Project” is now International! (Yes, I send afghans TO foreign countries, but this is the first time we’ve ever RECEIVED squares from a foreign country! and Canada counts, too…hehehe). The postage on the Australia package was $15.90 and it wasn’t a big package! I’ve very grateful to the people who sent them and will send them each a Thank you card. I don’t know if you are aware of it, but in Australia there aren’t many places to purchase already-made-up yarns or yarn shops, so this package is extra-special in that sense. (here’s where I’ve got to admit that I wasn’t too excited when he announced he wanted to join color guard . . . UNTIL I saw the amount of memorization needed to do all those moves with the flags and sabers, not counting making sure you are not hitting the other marching band members you are moving in and out of line with). I’m proud that he’s able to do all this and, do it well. Way to go, son! Tomorrow starts the weekend and will find me attending a half-day music/choir seminar, then attending a fund raiser in the evening for a friend who’s son died about 5 years ago of a brain tumor. He was greatly into archery (was practicing for the Olympic Archery team) and his family wanted to do something to help the college archery team to continue so they have organized a yearly dinner & fund raiser for his former college’s archery team. It will be a good evening, good food and a change to see people we used to work with. Hope your week and coming weekend are pleasant. It’s been in the high 50’s – low 60’s the past few days. The leaves are POURING down in my yard but the sun is shining and there’s a slight breeze – very nice Fall weather! Just Couldn’t Resist – Fall Recipes! While going through my many ‘recipe-list’ emails, spotted some really yummy-sounding ones and (like the title says) just couldn’t resist! Hope you might find one (or more) to your liking! Enjoy!!! Cook bacon in a large skillet. When done, remove cooked bacon to paper towels to cool, reserving bacon drippings in the skillet. Crumble bacon when cooled. In the meantime, brown ground beef and chopped onions in the skillet with the bacon drippings. Drain when meat is lightly browned and place meat in a Dutch oven or slow cooker.Add crumbled bacon and the remaining ingredients. Place squash cut side down in baking pan with 1/4 inch of water in bottom. Bake 45 to 50 minutes or until squash is tender. little water. Microwave on high five to seven minutes or until squash is tender. )In saucepan, combine butter, cherries, pecans, brown sugar and cinnamon and heat until butter melts. Mix well.Spoon one-quarter of the cherry mixture into cavity of each squash half. Serve immediately. Makes four servings. Drain tomatoes; reserving tomatoes and liquid separately. 2 1/2-quart casserole. Sprinkle with cheese. Spoon stuffing mixture evenly over cheese. 1/2×2 1/2 inches, with shortening or spray bottom with cooking spray. from pan to wire rack. Cool 30 minutes before slicing. and fry till firm and golden. Flip over and fry on the other side. Serve warm sprinkled with a little cinnamon sugar or powdered sugar. Beat cream cheese with mixer until creamy. Blend in sugar and egg; spoon over batter.Bake 18 to 21 min. or until toothpick inserted in centers comes out clean. Cool 5 min. ; remove to wire racks. TIP: Stir 1/4 tsp. ground nutmeg into 1-1/2 cups thawed COOL WHIP Whipped Topping; spread over cooled cupcakes. Keep refrigerated. Today is another SPECTACULAR “Indian Summer/Fall” day – sun is shining brightly, crisp but not cold air – just great for football games. Speaking of which, youngest is performing at the local high school game: his school and their rival; perfect day for it! After dropping him off at school at 9:30 a.m., went to the library, got gas for the car, stopped at our local Krogers for groceries then Tim Horton’s for coffee (husband loves their coffee). It’s a nice, quiet day here; I’m enjoying the sunshine and relaxing a little on the computer. Just finished a quick knit scarf for a present for my friend, Sally – she’s the local historical society’s President and they will be holding a “Christmas in October” craft/baked goods sale next week. I asked if she could use any donated craft items and she said yes. Working on a couple pairs of baby booties to go with the completed baby afghan & ‘bunny blanket’ buddy, then hopefully I can mail them off this coming week. The furnace installation got moved to this Monday, so had to get any ‘running’ out of the way so that I’m here for that. Sure hope they get all they need DONE on that day, as this coming week’s calendar for youngest son is already overflowing (lots of ‘drop off’ and ‘pick up’ schedules) – Mom’s TAXI will be running on overtime! Kinda crazy week – Tuesday found a ‘surprise’ visit from my husband’s cousin – with the new furnace and air conditioner! Totally unannounced, so that made for some very fast moving stuff, straightening, etc. to get the space opened up for the large machines. Our basement is a Pack Rat’s Heaven, so I’ve been down there getting rid of lots of ‘old stuff’; there’s still a ton to do, but at least there’s room to move around when they come today to install the above machines. It’s been such a scramble that I’ve had to actually look at the calendar to see just ‘what’ we did each day – band practices/competitions, Knit group, special needs group, babysit grandson, etc. It’s FRIDAY! Oh, throw in a trip to the BIG garage sale down the street; they hold it twice a year and I’ve been attending for a good 20+ years now. What did I purchase, you ask? I think this was the very smallest I’ve ever done-a spring/summer skirt for me, a really nice teddy bear for a baby present, and a spider plant starter (my mature one is looking very ‘thin’ so this will, hopefully, make the pot look fuller…I hope). Grand total of three purchases: $7.50. That doesn’t mean they didn’t have tons of items available, it means that (1) I was really short on money and (2) also short on available time to look. I have noticed in the past year or so that the economy has taken it’s toll on the available items at garage sales – people are holding onto their ‘valuables’ more. The above mentioned sale usually has a plethora of almost every imaginable item: clothes/shoes/toys/kitchen-household/electronics/furniture/books/sports, etc. but I’ve noticed that not only the quantity but also the quality have reduced quite a bit since the down-turn in our economy here in Michigan. 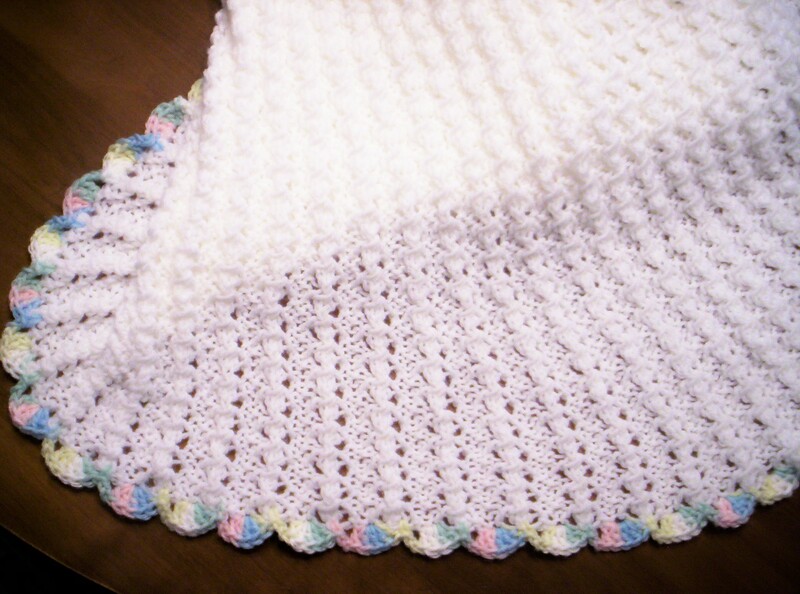 Finally managed to get the edging done on the baby afghan I knit several months ago – YAY! I found a different yarn this time for the edging, as I have learned the baby will be a boy. The yarn I’ve used on ones before has a bit more pink and is much brighter. I kind of felt that this one should be a little more muted; the colors go together better with the little mint green ‘bunny blanket’ I knit to go with it. Want to make a few more baby hats to go with the blanket, then it’s ready to mail in time for her February delivery. 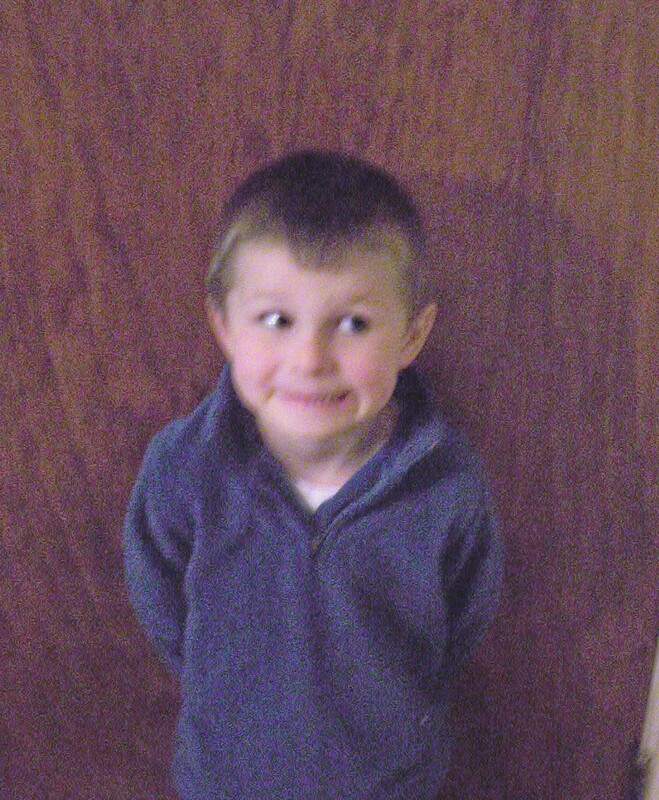 Grandson’s visit yesterday reminded me of his father when he was four – his sense of humor cracks me up. How, you ask? Let’s put it this way – we’re in the era of Knock-Knock jokes . . . remember those? His dad said that the first day of pre-school while the parents & kids were waiting outside in the parking lot, my grandson decided to Wow the crowd with his joke and, I guess according to his Dad (who was equally amazed), he delivered it flawlessly. As they were relating this to me last night, grandson looked at his dad and said: “It’s all in the timing, Dad . 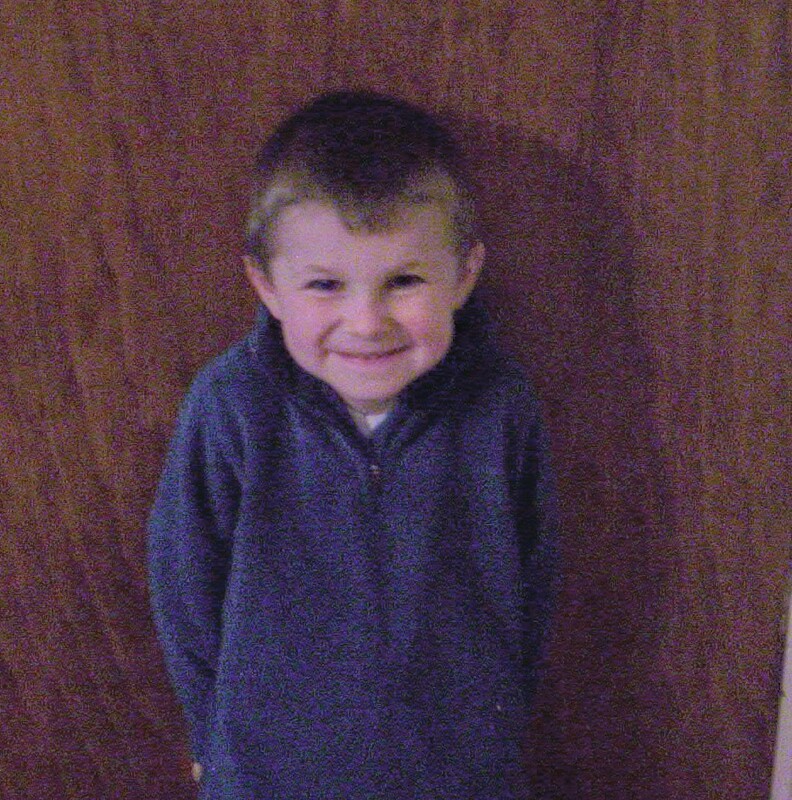 . . right?” Yep, just like his Dad at that age … 4 going on 40! Well, I’d better get off here just in case the furnace guys arrive while I’m still trying to gather my thoughts to write this! My knit group really IS incredible! I knew we created more hats than last year’s donations to Stitches from the Heart, but I certainly didn’t expect us to do ONE HUNDRED! Thanks to Missy, who headed up this project, we have a wonderful presentation to a worthy cause. Waterford-Area Knitters & Crocheters ROCKS!!! Photo with two hats: sometimes when I am given ‘donated’ yarns, there will be little ‘surprises’ in the bag. In this particular bag lived a small bag of tiny crocheted squares. Not being one to like to waste anything, I tucked them away for ‘later’. The other day while digging in the ‘little odds & ends’ bag of yarn I came across the tiny squares. 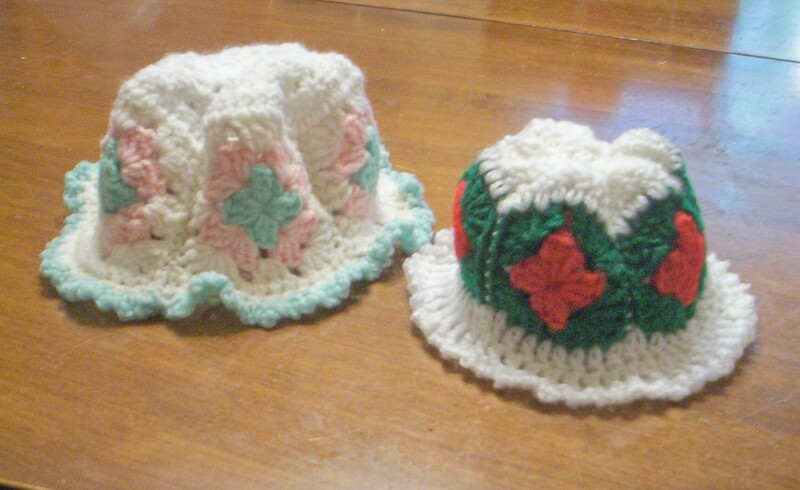 I was feeling ‘creative’ so I thought: “Why not try to see if I could crochet them together to make a baby hat?” The tiny one is for a Premie, and the one on the left is for a regular sized baby (it also has crocheted ties underneath the hat). They didn’t photograph as nicely as I’d have liked, but you get the idea. I like the way both hats ended up with little bumps on the tops. 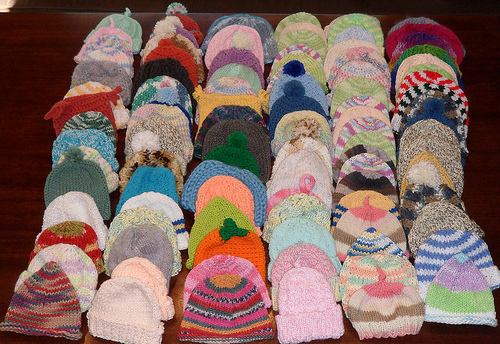 Photo of 25 more knit Premie hats for Save the Children Foundation’s “Caps for Good”. I love playing around with these – they allow me to use up small bits of yarn AND try out various pattern & texture ideas. Save the Children says that nearly 4 million children around the world die in their first year of life; half of those die in the first 24 hours. Many of those children die of preventable causes, and sometimes simply keeping the baby warm can make a huge difference. 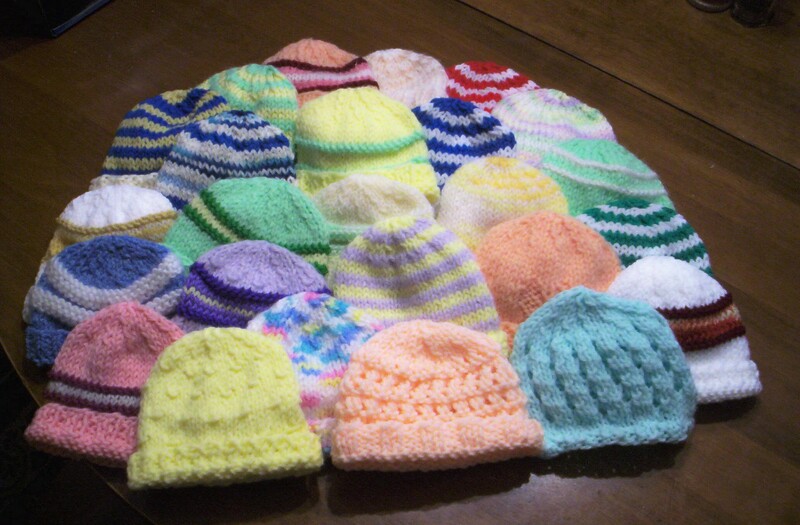 The website has a downloadable PDF with more information, patterns for knitting and crochet and information about where to send the hats. This year they’ll be going to new moms through the Save the Children newborn health programs in Indonesia, Mali and Guatemala. And a happy, gloomy/rainy Saturday to you, too! It’s been a rather quiet week around here; husband has been home almost all week sick with a sinus infection (finally convinced him to go see the doctor Friday; he’s been miserable for days). Life takes on a different tone when people who are usually gone during the day are suddenly at home for days at a time – kind of throws off my usual ‘schedule’. Youngest is in his first band competition today in Brandon, MI. and was quiet nervous when I dropped him off at school at 9 a.m. His group is doing sectional practices 9-10, then with the entire band until around 11:30, lunch at school then off to the competition. He said they probably wouldn’t get back until at least 10 p.m.; I’m sure hoping it gets a little drier out – they are not allowed to wear anything over their uniforms while sitting in the bleachers outside (like heavy coats) so I’m not looking forward to hearing how cold/wet he got – sure hope he doesn’t get sick from it! He told me that the people who have been in it last year said that EVERY competition it either rained or snowed – oh, joy! He’s thinking about being in Winter Guard, also – I guess they only do competitions and all indoors, so perhaps it won’t be so bad – we’ll see. Our Knit Group had it’s Three Year celebratory meeting Tuesday and we had 19 attend plus one new lady and someone who stopped by to ask for information on joining the group. ‘On paper’ we now have 39 members, most of whom attend fairly regularly. ‘On line’ on our MeetUp.com site we have 61 members; I don’t count most of them as there are people who sign up to be members who don’t even live in Michigan! What person signs up for a group and doesn’t even live in the area? Why would they want to do that? Beats me! I’m just glad the group continues to grow and that we all get along so well – it’s a hoot – the ladies are such fun to be with! I’m still working on afghans and premie hats; guess it’s going to be ‘my thing’ with the baby hats for a while now. I’m waiting for the final count and photo(s) on the total hats turned in for Save the Children Foundation from our group – will post a photo when I get it. In 3 quart saucepan, cook bacon over medium heat until browned. Add onions, continue cooking until tender (2-3 minutes); drain. Add potatoes, water, salt & pepper. Continue cooking until potatoes are tender (15-20 min.). Reduce heat to low; stir in soup, sour cream and milk. Continue cooking, stirring occasionally, until heated through (3-5 min.) Season to taste. Makes 6 (1 C.) servings. In large bowl, whisk together cheese, flour, baking powder, salt and cayenne. Pour in beer and honey. Stir just until combined. Fold bacon into batter. Spread into prepared pan. Brush top with melted butter and push remaining strip of bacon in the top.Bake until loaf is golden and a cake tester comes out clean when inserted into the center, about 60 minutes. Let cool in pan for 5 minutes and turn out onto a rack to cool. Serve warm with your favorite stew or soup. Makes one loaf (12 slices). In a medium saucepan, bring milk to a simmer over medium heat. Add cream cheese and gruyère, stirring often until cheeses are melted. Add garlic, Worcestershire, salt, pepper and nutmeg. Add scallions, then add spinach, one large handful at a time if needed, until it all cooks down and fits in the pan. Stir until spinach is wilted, then add artichoke hearts; add cornstarch mixture and stir until combined. If you want to thicken the dip more (it will set slightly after you take it off the heat), add another tsp. of cornstarch mixed with water. Add crab meat and stir until warmed through. Taste dip and add more salt or pepper if you like. Serve right away or refrigerate and gently reheat in the microwave in short intervals, stirring after each. Sprinkle with a dash of cayenne pepper and/or paprika for color. Serves 4; can be doubled easily. Combine oil, eggs, sugar and vanilla. Beat at medium speed for 3 minutes. Add dry ingredients at low speed. Batter will be thick. Add pecans and apples at low speed. Pour batter into prepared tube pan, and bake at 350°F for 1 hour and 30 minutes, or until cake tester comes out clean when inserted in center of cake. Cool in pan for 10 minutes, then invert on serving plate and remove pan. Drizzle Brown Sugar Icing over warm cake. Combine butter, brown sugar and milk in a heavy saucepan. Over medium-high heat, bring mixture to a full boil. Cook, stirring constantly, for 3 minutes. Let cool to lukewarm. Hope you are able to enjoy this Saturday: stay WARM, comfy and try to enjoy the day!